The last time everyone in my immediate family was in town we all sat down to watch a horror movie. My family loves a good scary movie. We live in an old wooden Victorian home that seeps at the seams with the creaks and rustles that build tension in ghost stories. Fear has a fun and almost playful dimension to it in a good movie. But sometimes horror gets too hung up on fear and forgets itself. Horror movies often ignore the hallmark of a good story in favor of some cheap thrills. So many mediocre horror films butcher their own themes to manufacture fear and end up lifeless because of it. Trying to think up a good horror film to watch, I recommended Oculus. It is a very well put together film with solid acting and camera work, but it was ultimately mediocre. “It has a pretty bad ending.” I’d say, but it was more than that. It was a potentially great movie that chose to be mediocre. In the shiny new horror title Oculus, a pretty standard scary movie plays out with an interesting psychological twist. Two siblings pit themselves against a satanic mirror that essentially killed their parents. The sister leads the charge and eventually recruits the reluctant brother who mostly wants to move on. The novelty of the movie comes from the way the mirror twists the reality around the siblings until they have to find cues and create signs of sanity to avoid getting destroyed by it. Bone piercing dread slips into what would otherwise be another dull battle with demonic forces. It isn’t a perfect movie, with some twists and reality bending moments feeling fairly predictable and some standard horror overacting. The two siblings standing next to the possessed mirror. Photo courtesy of a review of Oculus from the film focused blog The Movie Guys. However its biggest failure is not in cinematography or acting, but the mismanaging of a great theme. Like any good scary movie protagonists, the hubris of the two siblings lead them into trouble. They assume they can handle the mirror. Obviously they can’t. The movie plays out with perfect pace and little problem as the mirror brings back the trauma it inflicted on their childhood. In the final moments Oculus shatters its own momentum and dismantles motifs just to keep the audience on edge. In the last thirty minutes of the movie the siblings uncover repressed memories of the reality behind the death of their parents. Possessed by the mirror, their father kills their mother and turns on them. With almost no chance of survival and the end nearing the kids cower near the mirror. In one tiny act of defiance the dad turns the gun to himself – against the will of the mirror – and shoots. His body smacks the corner of the mirror and gives it the only blemish it ever had in its centuries long history. What builds is a human theme that a sense of love creates reality; that this familial, human love is the only thing that could fight back against an inhuman, monstrous force. Even if it is just a scratch, it is the only injury on an otherwise indomitable force of dread. This theme gives real meat to an otherwise just well executed fear fest. In the end love renews sanity and brings clarity in madness. The message is incredibly hokey, maybe even gauche, but simultaneously timeless and sympathetic. When the ending arrives and Oculus promptly picks up the theme like a prized vase it just made and smashes it against the wall to draw some shock from the viewer. The mirror lures the brother into murdering the sister by distorting reality so he can’t see where she’s standing. He ends up carted off to an insane asylum screaming about how the mirror did it, and it goes back on auction presumably to claim another victim. Where was the love the film painstakingly built up to? Where did the lucidity of family go? The end of the film drowned it out after explicitly telling the audience that it was the only thing that could not be drowned out. The end of the film weakened it as a form of resistance after explicitly showing it as the only thing that could fight back against the mirror. Out of fear that the audience won’t feel afraid, Oculus contrives an awful ending that betrays its own themes in the ultimate low-risk horror move of killing off all but one lone, knowing character to clear way for a sequel. This is what’s truly gauche about horror. This is the turn off. Nothing horrifies mediocre horror more than sincerity to a theme. Without a theme any story becomes directionless and hollow. Unfortunately horror movies often ignore themes and motifs to pound fear into the viewer, but this just cheapens the genre to what many people complain it is now: lifeless, heartless, corporate creations with rehashed stories. Horror should hit home. Horror should stick with you in good endings and bad for the way that it drives at a point – just like any other type of story. It takes the courage to stick to a theme and deliver on it to actually hit home. Instead, horror chickens out. It gets scared of commitment and the cold feet scary movies have to their own themes turn anything memorable in them to something immature and fleeting. The problem does not end with Oculus. The dilemma extends to movies like Sinister – that also forces a bad ending on the audience likely to pave the way for its recently announced sequel – and so many others that have a glimmer of greatness and settle for the alright. Jack’s insanity memorialized. Taken from this blog post. Thematically well made horror is not an impossible dream either and The Shining shows this by endlessly building on themes of interior versus exterior and pure delusion. The Shining ends with the father of the family, Jack, alone and frozen in a maze, a smile plastered on his face. Overlook Hotel seems fine on the outside, but it is a malevolent place trapped in a terrible time. 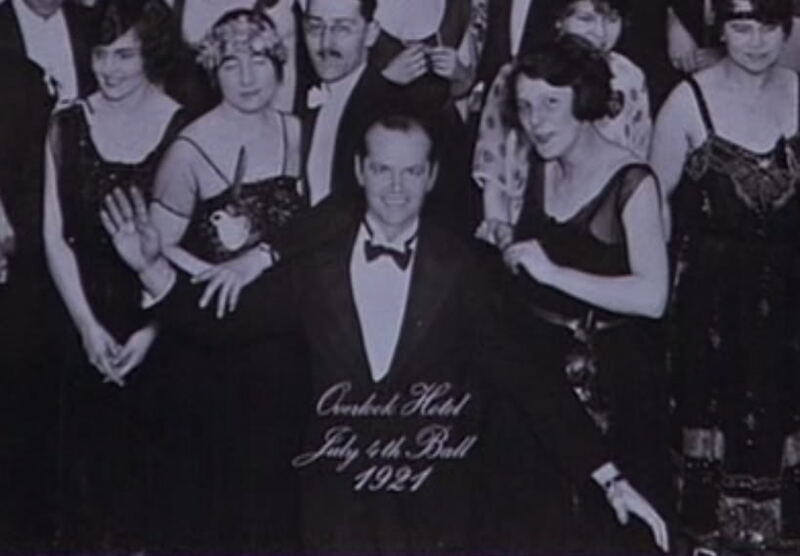 Engulfed by the hotel, Jack takes on its character so completely that his smiling façade belies a twisted interior, all of which is frozen in place. The end of the movie completes Jack’s delusion by directly putting him inside an old, black and white photo of the bar he saw in his insanity. The themes of façade versus interior and delusion to even the time period play out in simultaneous perfection at the end of The Shining. If The Shining were made with an ending like Oculus’s Jack would butcher his family and snap out of it as the cops wheeled him away. It would feel cheap and it would lead to a sequel that would feel even cheaper. Modern horror with a completely bad ending can also capitalize on themes to create a more memorable experience. Let the Right One In – an austere vampire flick – thrives off of soul-sucking loneliness that every frame of the cold, empty Scandinavian scenery compliments. The trials of a lonely boy with an ever working mother provide the basis of a sense of solitude that does not end until the curtain call. Let the Right One In paints a dreadful, ageless child vampire that hides behind an aging and dying thrall. With every moment the white as snow vampire girl further seduces the lonely boy. Her warmth to him radiates amidst his cruel classmates, absent mother, and the snowy Swedish landscape all around. The contrast of the vampire’s simple warmth to the boy’s cold life stirred up my stomach for a week. Through themes Let the Right One In creates a vampire that is simultaneously frigid beyond belief and the warmest thing in a boy’s whole world. I slept fine after the movie’s end, but I never forgot it. Stills of the film stick to the lining of my subconscious like paintings in a museum. The tremendous use of solitude had captured me. The lonely boy sits bundled and guarded next to the vampire, who is warm even in the cold. Taken from the film’s trailer. Films like The Shining and Let the Right One In make me want to return in earnest to horror. Yet each time I want to embrace the genre it rejects the sincerity of its own messages and motifs so suddenly and purposelessly that I have to deny the genre. I have to refuse it for something bolder. I have to find genres that have the guts and gore to say something real at the cost of pulling back on some emotional punches. I am not calling for the end of all modern scary movies. I really want to love horror. Nor am I lobbying that all horror must be fine art. Slashers can deliver on themes too, and I don’t want to live in a world without them. Rather, I want to rally against what makes horror lifeless: the way it murders its own messages, motifs, and themes.